Two directory traversal vulnerabilities have been found in GeekSoft File Expert and File Expert HD. 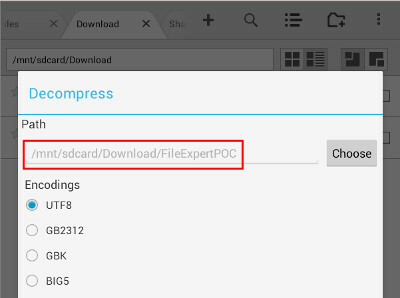 When exploited, these vulnerabilities allow an attacker to gain access to the application's configuration files or to write files to arbitrary locations within the SD card of the user's Android device. This advisory discloses two directory traversal vulnerabilities in GeekSoft File Expert and File Expert HD. When exploited, these vulnerabilities allow an attacker to gain access to the application's configuration files or to write files to arbitrary locations within the SD card of the user's Android device. The FTP server does not properly sanitise FTP requests containing directory traversal sequences (forward-slash ../) in their filenames. This can be exploited by authenticated malicious attackers to download the application's configuration files which can contain the user's saved passwords. An example of a malicious FTP request is shown below. 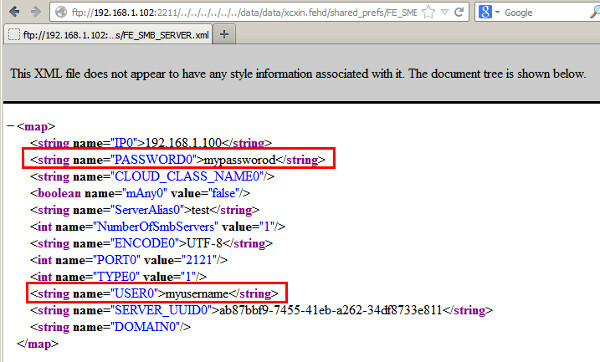 The instructions below illustrates how this vulnerability can be reproduced using File Expert HD. The steps for reproducing the vulnerability on File Expert are very similar, and hence, will not be repeated. 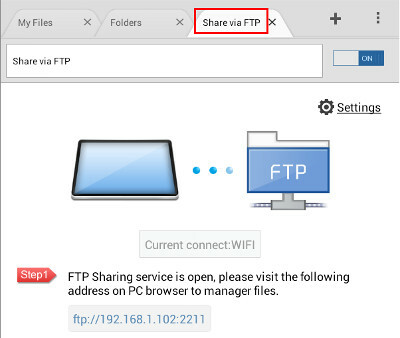 Start the FTP Server in File Expert HD on an Android device. Use the Firefox browser to access the FTP Server and confirm that some basic directory traversal protection exists. i.e. CWD .. is blocked. Now, use the FTP Server directory traversal vulnerabilty to access File Expert HD's data folder by navigating directly to the following FTP URL containing directory traversal sequences. Note: Change IP address in the URL to the IP address of your Android device. Download the FE_SMB_SERVER.xml file and note that it contains the user's FTP client password if the user has configured FTP client settings in File Expert HD. By exploiting this vulnerability, a authenticated malicious attacker can download the application's configuration files which can contain the user's saved passwords. Please download the POC ZIP archive here and follow the instructions below. Decompress the POC ZIP archive into the current path. When the extraction completes, navigate to the /mnt/sdcard/DCIM directory. You'll notice that zipPOC.txt has been extracted into /mnt/sdcard/DCIM/zipPOC.txt instead of into /mnt/sdcard/Download/FileExpertPOC/zipPOC.txt. Hence, by tricking a user to extract a specially-crafted ZIP archive, an attacker can potentially exploit this issue to write files into arbitrary locations within the SD card in the user's Android device, or to overwrite files in known locations within the SD card. Do not allow untrusted persons to access your FTP file share and avoid extracting untrusted ZIP files. 2013-05-26 - Initial Vendor Notification. 2013-05-27 - Vulnerability Details Sent to Vendor. 2013-05-31 - Asked vendor for release date of fixed version (no reply). 2013-06-05 - Asked vendor for release date of fixed version (no reply). 2013-06-11 - Asked vendor for release date of fixed version (no reply). 2013-06-13 - Vendor replied that they are still working on it and will release update later in the week. 2013-06-19 - Tested new versions and found that vulnerability is not fixed.